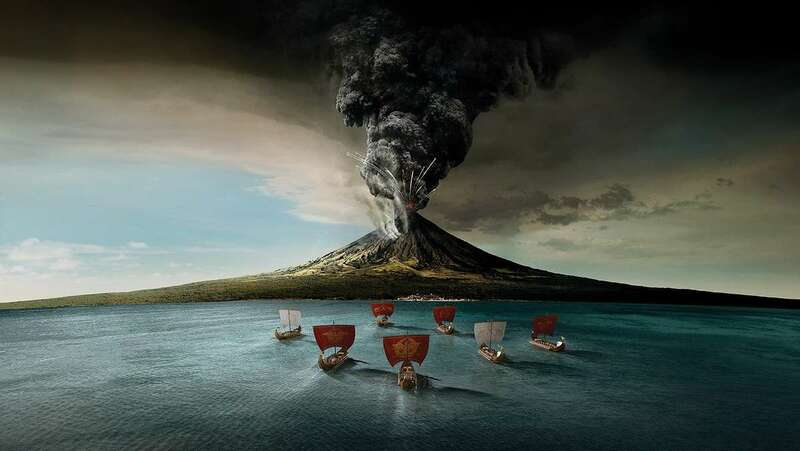 An illustration of the eruption of Mount Vesuvius in 79AD. Image: ANMM. The date the eruption which consumed Pompeii is normally given as 24th August, as this is the date that appears in the standard classical text of Pliny the Younger’s Letters. It is written down as nonum kalends Septembres – the ninth day before the first (kalends) of September – which, to the modern reader seems an awkward way of recording a date. Interestingly this date does not agree with the only other detailed account of the eruption: Dio Cassius, in his Histories written about 200 AD, recorded that the eruption happened in late autumn ‘kat auto to phthinoporon’. Though Pliny was an eyewitness (but writing two decades after the event), the archaeological evidence tends to favour Cassius Dio’s timing for the eruption. In 1797 Carlo Maria Rosini, in his Dissertationis isagogicae ad Herculaneum voluminum explanationem pars prima, argued that the traces fruits harvested in autumn – such as pomegranates, chestnuts, dry figs, raisin grapes, pine cones and dates – found at both Herculaneum and Pompeii, meant that the eruption could not have happened in late August. He also noted heating braziers in the public rooms of some of the houses as evidence of cold weather, he suggested an eruption date in late November. 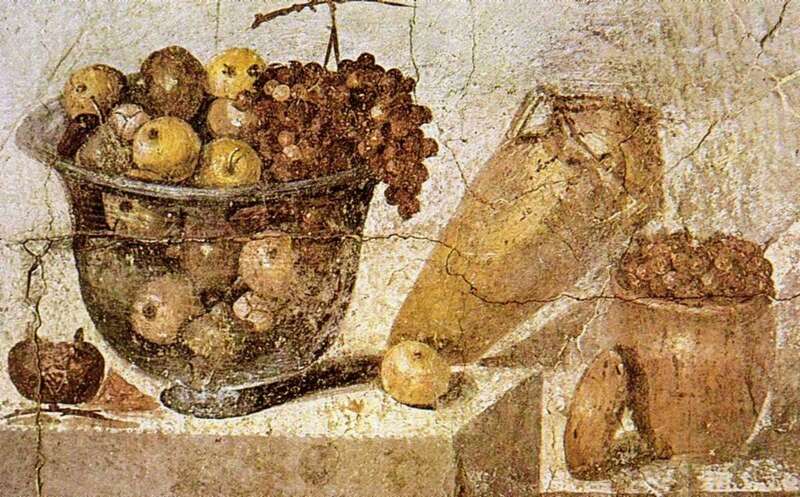 A still life fresco showing fruit bowl, a jar of wine and a jar of raisins from House of Julia Felix in Pompeii. Image: Museo Archeologico di Napoli, via wikicommons. Later archaeologists concurred Rosini and Cassius Dio, noting evidence that the grape harvest had already taken place: Not only were grapes present but also the waste products from pressing and sealed large underground amphorae indicating that new wine had recently been produced and stored. According to Pliny the Elder, the grape harvest happened between 24 September and 11 October. 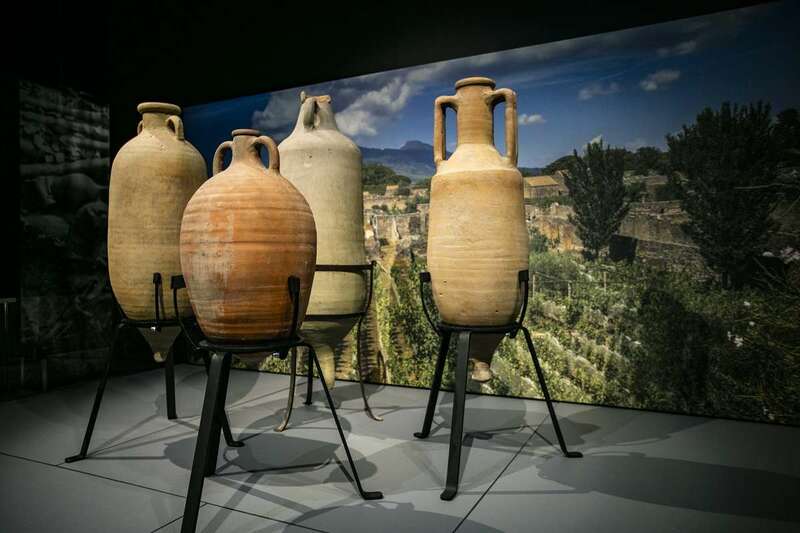 Wine amphorae displayed in Escape from Pompeii with Pompeiian vineyards in the background. Image: Andrew Frolows/ANMM. Other fruits normally harvested in September and October have also been found: Figs, walnuts, carobs and olives. Pomegranates are harvested in late September, but they have been found in large quantities including at the Villa of Oplontis, where over a ton of pomegranates were discovered laid out on mats. Yet more pomegranates were also found on the floor in the Villa of the Mysteries in Pompeii. 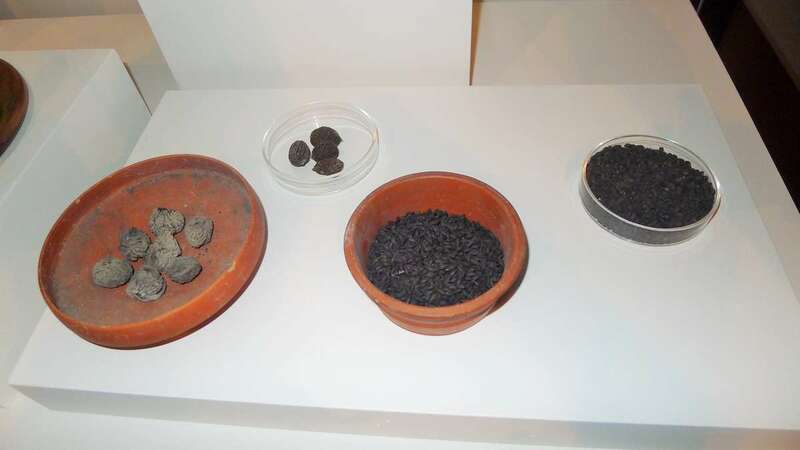 Figs, in the bowl to the far left, and grains found at Pompeii, as displayed in Escape from Pompeii. Image: Will Mather/ANMM. heavy clothing unusual for the hot muggy weather of an Italian August. However, what you wear in a volcanic blizzard may not necessarily be indicative of the temperature, but rather reveal the need for protective clothing. 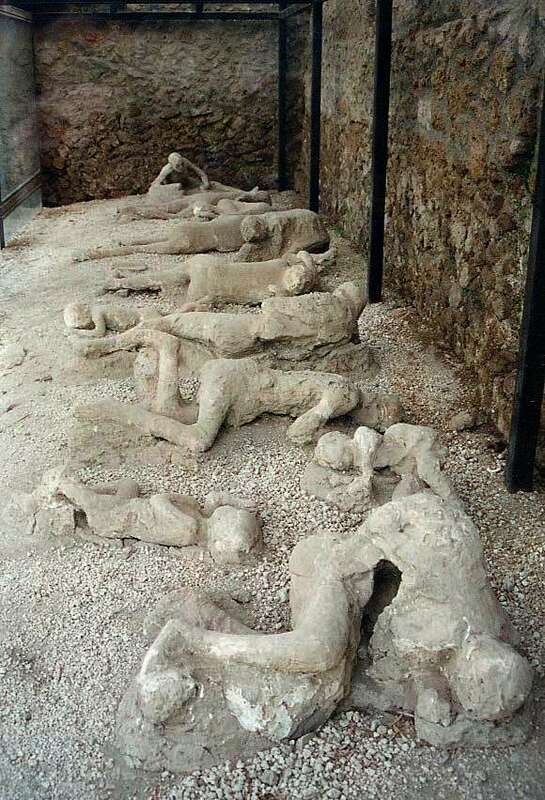 Plaster casts in the Garden of the Fugitives, Pompeii. Image: via wikicommons. Two coins of Emperor Titus were found with a group of victims (two adults and two children) excavated in the House of the Golden Bracelet. Titus became Emperor on 24 June 79 AD. Based on the Emperor’s titles it has been argued that one of the coins must post date September 79 AD. However, Richard Abdy points out that the coin is in very poor condition and that the inscription has subsequently been misread. He thinks the coin dates to either July or August 79 AD. It would be unusual – but not impossible – for coins of Emperor Titus to be circulating in Pompeii by 24 August. It does, however, suggest a later date. A study on the modern seasonal high altitude wind directions over southern Italy suggests a later timing too. From June to August winds are generally to the west, in autumn and winter they tend to blow to the northeast and southeast. The ash dispersal pattern – a little ash in Herculaneum to the north along with a great deal in Pompeii and Stabiae to the south of Vesuvius – indicates that the wind was blowing south east on the day of the eruption. So how did Pliny get it wrong? Well, he may not have. The letter was written around 100 AD, and later became part of nine books of letters published by Pliny before he died in 113 AD. A tenth book of his letters to Trajan was published after his death. Publishing at this time meant copying out by hand. There would have been a number of manuscript copies of these letters made in his lifetime, after that the preservation of the letters required new copies to be made as the paper decayed. Copying was time-consuming and expensive so decisions had to be made of what to copy. The collapse of the Roman Empire and the rise of Christianity influenced which Classical texts were prioritised to be transcribed. Luckily, Pliny’s polished writing style was considered good for studying Latin, still the language of learning, so his Letters continued to be copied over the centuries but not without errors. With each new copy mistakes easily crept in, especially when the monks doing the transcribing were not interested in the content, didn’t understand what they were copying (after all, the Roman dating system is not straightforward), or if the manuscript they were working from was itself badly damaged. During the Renaissance, the renewed interest in Roman and Greek writers led to the surviving works of Ancient authors to be tracked down so that modern printed editions could be made. There were several manuscripts of the Letters surviving, though in varying states of completeness and quality. One of the earliest and most complete manuscripts found was the Codex Laurentianus Mediceus (named for the Library that now holds it – the Laurentian Library of the Medici in Florence), it dates to the 9th Century AD. The Codex Laurentianus Mediceus gives the date of the eruption as Nonum Kal. Septembres (24th August). Other manuscripts had different dates: some do not specify a month, others give Kalends Novembres (1 November). Indeed, eleven different dates have been identified among the surviving manuscripts and early printed editions, ranging from 24th August to 24th October and even early November. But as the Codex Laurentianus Mediceus is the main source for the standard classical text of Pliny’s Letters it is the 24th August date that appears in the majority of translations. So a scribal error, likely from sometime between the 1st century and 9th century AD, could explain the conflicting dates between Pliny and Cassius Dio. When considered with the archaeological and botanical evidence, there is support for the theory of a late autumn date for the eruption. — Will Mather, Curator Escape from Pompeii.